Dreaming of a far away honeymoon in Seychelles? Talk to our travel designers and let Into Seychelles take care of all the arrangements for you. Having personally visited each destination, our jet-setting travel experts offer fifteen years of experience in planning memorable honeymoon vacations to the beautiful Indian Ocean Islands of Seychelles, just off the coast of Africa. We offer insider recommendations, special luxury surprises and ideas for an unforgettable experience. All you need to provide is your choice of travel dates, and we'll custom design a honeymoon to your unique ideals. Sit back and enjoy this online presentation on romantic luxury honeymoon ideas to pamper your loved one in the Seychelles. 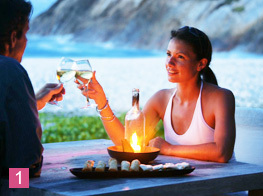 Mark a special beginning in the Seychelles, spending blissful days lazing in the surf, sand and sun -- in high style. Romance abounds at our Top Romance & Honeymoon destinations, where luxury, amenities and the backdrop of spectacular sun-drenched beaches set the stage for a perfect away-from-it-all escape. Stay 4 nights, get 5th night Free. Plus! Complimentary spa treatment for the honeymoon couple, private candlelit dinner for two with a bottle of wine and luxurious turndown service, and more!